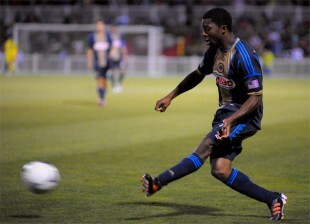 Philadelphia Union are unbeaten in their last five games. Wait, what’s that? Unbeaten in five? Really? Ok, so two of them were lower division teams, and a third was Chivas USA, who are worse than many lower division teams. But then you toss New England and Vancouver into the mix, and suddenly that’s a proper streak. What does that say about this team? Ask me in September. The talent level remains playoff quality — in theory. Let’s see what they do against legitimate MLS competition for a while. Here are five more things to say about this team. Coaching carousel spins to … Rene Meulensteen? Talk about rumors all you want. If Rene Meulensteen is sitting in a stadium box with Nick Sakiewicz cheering for the Union, it’s because he’s a candidate to be their next manager. Meulensteen is an interesting candidate, to say the least. He spent a decade-plus with Alex Ferguson at Manchester United, and he was highly regarded during his tenure there. As a manager, however, Meulensteen has been star-crossed. After spending eight years coaching in Qatar, Meulensteen managed three European teams and, for one reason or another, spent no more than seven months at any of them. Brondby, 2006: He succeeded Michael Laudrup at the Danish club in 2006 but left after six months, criticizing the organization as “a very sick patient requiring immediate attention.” When he left, the team was in seventh place. They had previously finished in the top two in the league every year since 1994 prior to Meulensteen’s hiring, but they haven’t done so since. Anzhi Mahachkala, 2013: Meulensteen spent 16 days as manager after Guus Hiddink resigned last year. This happened after the briefly high-spending team’s owner decided to gut the payroll. Fulham, 2013-14: He got three months as manager of Fulham, winning just 4 of 17 matches before the axe came. The team was eventually relegated, and three big name managers couldn’t stop it. Is Meulensteen a good candidate? Hard to say. He certainly is a big name. But he also has no experience with the complicated MLS personnel management rules, salary budget or American youth development system. In his only off-season managing in Europe, he came under fire at Brondby for several ill-advised transfers and attempts to force out established players. That was eight years ago, but he could find it even more difficult to move players in MLS. His hiring would probably necessitate a parallel hiring of a traditional American-style general manager or technical director to handle player personnel. Such relationships have rarely worked out well with European managers used to enjoying full control of player acquisition through straight transfers. The consideration of big European names — Fabio Cannavaro is also in the rumor mill — may placate some Union critics, but recall the cautionary tale of Ruud Gullit, unable to adapt to the intricacies of MLS. Union chief executive Nick Sakiewicz offered some fantastic insight on MLS coaches during Jim Curtin’s introductory press conference last month. “So you have a different culture. You obviously have a different country. You have a large amount of your players that are Americans that have come up through the college system or come up through the youth soccer system. Varying degrees of coaching along the way. And when they get to the top tier, Major League Soccer, they need to continue to learn, because they’re not — this is a country that is still evolving, so the level of coaching in this country at the younger tier is not as seasoned as the level of coaching in Europe or South America, for example. So the kids when they get to MLS, they need a teacher, they need a manager, they need to be taught tactics and technique even still, and how to strike the ball, and how to pass the ball, and where to pass the ball, and how to defend and how to attack. “And the makeup of the foreign coaches that come here — that’s not the way it works in Europe or South America. When a player comes to the first team, he’s expected to know tactics [and] technique and have perfected things. So many of the foreign coaches that come here don’t have the patience or they get frustrated with the level of the player at the first tier. They also get frustrated that they just can’t get the owner to open up a checkbook and write a check and dismiss an entire group of players. That’s not the way we work here. So if they’re not prepared for that, if they’re not prepared to be teachers, even at the top tier here, they often fail. Does that mean Sakiewicz will hire an American coach? We’ll obviously find out. But it’s an excellent articulation of why he should. Take Danny Mwanga, for example. How do you think he might have done had he been traded to Salt Lake instead of Portland (then in turmoil) and gotten to play for Jason Kreis? Or Brad Davis, Kyle Beckerman and Chris Wondolowski, who have peaked at an age when most European players are on the downward slope? The players produced by America’s youth system have a different development curve because of the youth and college system here. Jack McInerney and Andrew Wenger: Will they always be linked? Jack McInerney is on fire. This still takes some getting used to. If the reigning MLS player of the week leaves for Europe in six to 18 months, then people may not look as harshly on the McInerney-Andrew Wenger trade. If McInerney stays in MLS and Wenger doesn’t progress, it could go down as one of the worst trades in MLS history. Wenger had an assist against New England and scored in U.S. Open Cup play. There is a lot to like about him, but unfortunately, one of them isn’t his finishing ability. Wenger has seemed like a player without a position since he entered the league. He played center back and striker at Duke and midfield as a younger player. It always seemed premature when Montreal deemed him a striker. He’s not a bad player by any stretch, and it’s still possible that the Union could come out better in this trade over the long term, particularly if McInerney leaves for Europe on free transfer. Whoever takes over as Union manager should independently assess where Wenger belongs on the field. That same person should give him a jolt of confidence too, along with a lesson on dealing with the media. Yes, Mr. Wenger, the local media noticed you quietly and quickly ducking out of the locker room after games recently. Man up, answer the questions, and play your game. It’s part of being a professional. Take a lesson from Mike Lahoud. It wasn’t his fault he got traded for Danny Califf. He just came in, played his game, faced tough questions, and let the chips fall wherever they fell. Today, he is a model player for the Union. What got into Mike Lahoud? Whatever it is, it’s working. The guy is playing good soccer, and the Union look better with him in the lineup. Lahoud has struggled with injuries for the last year and a half, but he is healthy now and has gotten some call-ups from the Sierra Leone national team. Maybe that’s all it took. When healthy, he does a lot for the Union midfield. Of note, one thing he does well is pick up his head in the attack and look to push the ball forward, which not all the Union midfielders do particularly well. He’s a good athlete with solid range, so if you pair him with Amobi Okugo, you could have two defensive midfielders who legitimately push play forward through the center and cover a ton of area. Every team that Sebastien Le Toux plays for tries to put him in midfield sooner or later. It was more understandable for the Union when McInerney was on fire in Le Toux’s absence, but McInerney is gone. So it’s time for Le Toux to go back to forward again and stay there. Sure, go ahead and start Le Toux on the right side of an ostensible 4-2-3-1. That’s OK. Nogueira likes to range from sideline to sideline. Maidana likes to float wide but also be free to come centrally. That could give Le Toux the freedom to move centrally and make those deep runs he can make. Does that create chaos in the attacking third? Potentially, but not if all three of them read each other and fill different spaces on the field. Le Toux scored four goals last week. He hit the post against New England on what could have been a fifth. It all looked familiar. Do you remember what Le Toux scoring streaks look like? You may be about to see another one. Great article. Great points raised as well. Yeah, that quote was pretty impressive. I would never use one that long if it wasn’t such an excellent point. Absolutely, if Meulensteen has been seen with Sak recently because the Union brass is using him as a consultant for their actual hiring process, that makes a ton of sense. If you could accuse Sak of one thing, it’s that he’s naive about the technical part of the game, and perhaps he’s doing what he can to mitigate that factor in the coaching search. I’ll give Nick S. the benefit of the doubt for the time being, he did hire Bob Bradley once after all! Mac and Wenger will be linked for the imminent future. It places an unfair burden on Wenger. No doubt. He did nothing to bring it on, and hopefully he reacts better than this article suggests he currently is handling the situation. The larger question lands on Sakiewicz (especially after Hackworth’s departure) and the organization’s youth development woes. Sakiewicz is responsible–either directly or for Hack in absentia–for the trade. I’ve heard many things about a toxic locker room atmosphere with Jack and the rest of the team at the end of his time here. His demenor on the field often irritated me and other fans, and perhaps that bled into the locker room. Man management was one of Hackworth’s many weaknesses. Players rarely were given the opportunity to get out of his doghouse. As an outsider, Hack’s handling of Jack post-Gold Cup had a definite effect on his mindset. This all speaks to the larger issue of youth development that the team still faces. How is a youth movement going to ever occur when the homegrown players can’t see the field, you can’t control the playing time or positioning of players loaned to Harrisburg, etc? I’m just amazed that you guys had a Union article to post today. Those who worry about the relationship between Philly and Harrisburg might want to do two things: 1, look at the HCI roster for players with Union connections, including asking how Harrisburg ended up with Jose Barril and Luan Silva, and, 2, how the HCI playing style has changed. Yes, Pedro Ribeiro played at center back at the beginning of the season, TO REPLACE THE USUAL STARTING CENTER BACK WHO HAD A SERIOUS ANKLE INJURY, Coady Andrews. As soon as Andrews was back, in fact, even before, Ribeiro was switched up to striker after they got anther center back on loan from Richmond. Marquez has played right center back every game. Jimmy McGlaughlin has played nearly every game as a flank midfielder. Cristhian Hernandez has played regularly in the central midfield. Ribeiro seems no longer there since Jim Curtin took over, judging from who has dressed in the 18 for Curtin’s three games. The loanees are playing where you would expect and are clearly major contributors. Lahoud – yes. Looking so good in tight spaces with quick effecient touches. Definitely has the potential to push Carroll off the pitch. Seba – yes, a thousand times. It’s hard to deny that Seba and Casey up top have been the only consistent goal scorers this team has. Maybe it’s time to mold the rest of the team around them rather than the other way around? Foreign coaches – worried about this move. Feels like Sak is trying for a big PR move to show the fans that they are committed to winning, but it just doesn’t seem like a recipe for success in MLS. Perhaps Muelensteen has some ability to coach developing players, but I’d rather see the money spent on a goal scorer than a coach personally. I am again of the opinion that a manager makes significantly less impact on results than we’d like to think. It all comes down to the quality of the players on the field.